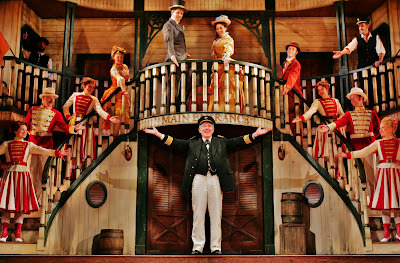 Lenny Wolpe as Captain Andy and the cast of Show Boat. 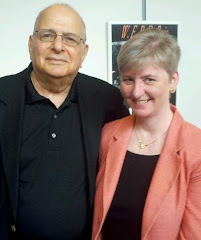 Photo by Diane Sobolewski. When it first was staged in 1927, Show Boat broke new ground as the first American musical play (shifting away from operas and revues) and in taking on the issues of family relations, love and hope against a backdrop of racial prejudice. The story and its characters are no less poignant today, especially in Director Rob Ruggiero’s slick revised version playing on the Goodspeed stage. Based on Edna Ferber’s 1926 novel, the musical spans four decades in the lives of folks working on the Mississippi and on the river show boat, The Cotton Blossom between 1887 and 1927. The setting couldn’t be more fitting – after all, Goodspeed is a beautiful Victorian opera house sitting on the banks of the Connecticut River. Bringing the musical, usually staged with a big cast performing huge production numbers on a large-sized boat to the smaller Goodspeed stage might have sunk the production without Ruggiero at the wheel. Under his skillful direction, however, this version is more compact (it’s a breezy two and a half hours) and focuses on the relationships at the heart of the story. The plot follows affable Captain Andy Hawks (a charming Lenny Wolpe), his uptight wife, Parthy (Karen Murphy) and their daughter, Magnolia (Sarah Uriarte Berry) who travel along the Mississippi staging shows on their boat. The star, Julie (Lesli Margherita) becomes close with Nola as well as some black folks working on the water, like Queenie (Andrea Frierson) and her husband, Joe (David Aron Damane). Julie and her husband, Steve (Rob Richardson), are forced to flee, however, when the law finds out that Julie is half black, making her marriage to white Steve illegal. Nola steps in as Julie’s understudy and falls in love with leading man Gaylord Ravenal (Ben Davis). She leaves the boat to join him for the uncertain life of the wife of a river gambler. She is forced to sell her valuables to keep them afloat, especially after the arrival of their daughter, Kim (played as a child by a skillful Madeleine Berry and briefly as an adult by Mollie Vogt-Welch). When her life is capsized, Nola is helped by old show boat performers Ellie May and Frank (Jennifer Knox and Danny Gardner) who have found success in romance and show business. Making this production totally enjoyable are the stellar performances across the plank. Vocally, everyone makes the beautiful Jerome Kern score (with lyrics by Oscar Hammerstein II) an absolute pleasure to hear. Michael O’Flaherty is music director of the larger-sounding small orchestra with nice orchestrations by Dan DeLange. There are some transpositions of tunes to accommodate the range of the performers and Ruggiero, with the blessing of the Rodgers & Hammerstein organization, juggles the order of and eliminates some tunes from the original soundtrack to help focus the story. He also inserts “Til Good Luck Comes My Way” from the 1951 movie version at the top of the second act as a replacement for the fair number. If satisfying our emotions and ears weren’t enough, this production is pleasing on the eye as well. Amy Clark creates costumes that convey the periods, but wisely chooses soft colors that keep the stage looking bright and uncongested (original costume design by Florence Klotz). Choreographer Noah Racey, challenged with space restriction, reins in some of the larger numbers, but goes all out when he has fewer dancers on stage giving Gardner in particular a chance to show off some of his dancing moves. 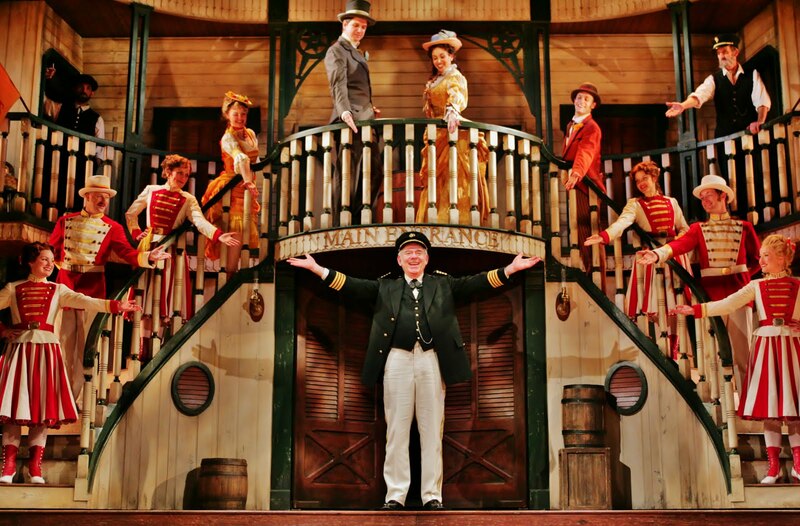 Scenic designer Michael Schweikardt’s show boat fills the stage offering two levels and side staircases on which to place performers, then converts into the Ravenals’ meager rooming house accommodations and also into the Trocadero. a club where Nola ends up singing. This production really is full steam ahead and due to demand for tickets, already has been extended. Get on board while it is docked at the Goodspeed in East Haddam until Sept. 17. For tickets, call 860-873-8668 or visit www.goodspeed.org.